T’is the season to be merry, of turkey, tinsel and snow with visits to Santa’s Grotto. I cannot promise you any of the above, we can though visit Our Garden@19 following a rain shower, looking for some winter cheer and colour. In the Oriental Garden the Witch Hazel is in flower, although it is not looking too cheerful due to its habit of retaining all the old leaves. The golden bamboo always adds a cheerful glow in the corner. Two of the Cornus are brightening up the back of this border, reminding me that the fence panels could do with re-staining! …the standard holly is an attractive centre piece here. …where the Rose ‘Charlotte’ has a rain drop covered bud surviving. The bark of the Prunus is always very attractive this time of year. The winter jasmine and the clematis are providing a splash of yellow, with the clematis climbing through the wisteria. The skimmia’s are also a welcome sight with ‘Rubella’ very popular with the flower arrangers at Christmas. … with moss appropriately growing in the crux of an acer tree. Hydrangea flower heads, in December, make wonderful flower arrangements and photographs. The title of December Rain is best illustrated with this picture of pine needles with jewel like rain drops, especially the close-up one below. I hope you have good reflections of 2018. Sadly we had to say goodbye to our faithful companion Murphy. On a happier note our youngest daughter, Mary is joining her partner James on the 22nd in their first home together. It will all seem a little quiet around here. 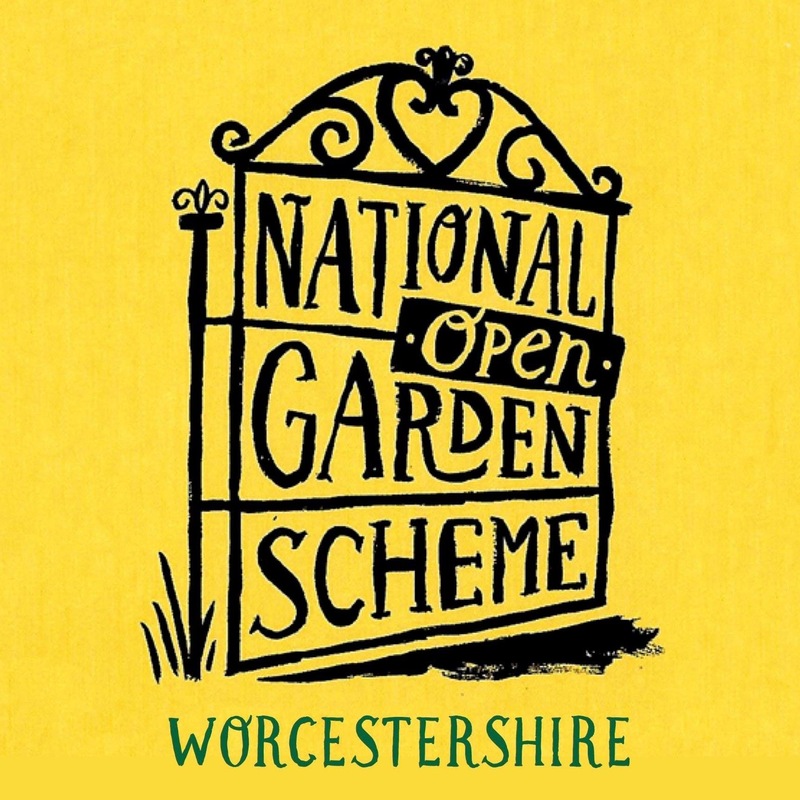 The Hanley Swan NGS open gardens had another successful year, with totals raised since we started four years ago reaching £8,500. Looking forward to the new year, we have a new garden opening with us along with ‘plans’ for our garden. Chaenomeles japonica with Phyllostachys nigra. Wordless Wednesday 28th March 2018. These winter months are the time of year I try to carry out any ‘estate’ maintenance along with completing the pruning of the climbing/rambling roses, wisteria, vines, the apples and pear trees. These all require the use of a ladder, which in the past has involved balancing on the top of a rather unsteady step ladder. Having some time ago reached the age where I don’t bounce so well and not wishing to add to the queues at the local hospital A&E department I have invested in a Henchman ladder. This is one of the best investments I have made in garden equipment. The ladder is similar to the Japanese tripod ladders, with adjustable leg heights to accommodate different ground levels and a bar at the top that you can safely lean into, so long as you don’t go any higher than recommended. This feature doesn’t seem to appear on the Japanese ladders which was the deciding factor for me when making my choice. They are made in the UK from aluminium and therefore very light to carry and come in different sizes. I did feel very safe using it this year, it can also serve as a coffee table! You can view more details Henchman Ladders. Two jobs required the help of a local builder, one has been the replacement of the walls to the raised herb bed. I originally built it, in 2004, with treated timber planks, as these have rotted away in places, I decided to replace them with new sleeper timbers. This bed is also home to a climbing ‘Albertine’ rose, on the trellis, a red currant fan trained along the side fence and a standard red gooseberry in the centre. The new bed is not as big, therefore more of the herbs will be in either terracotta pots or the old galvanised bath and buckets. The lawn just off the patio always looks a mess, especially at this time of year, it is not very wide and all the foot traffic passes through here ( human and animal ). I have had it edged with porous black pavers, to match the ones incorporated into the patio design. Wether the grass remains, in this small area, or is replaced with gravel, is yet to be decided. Another option is artificial grass, I am following Cathy at Rambling in the Garden’s progress, with interest, to see how she gets on with her small installation. I have also edged the fence along the Green and White garden with the pavers to save having to strim the grass. Our neighbour has a willow (Salix) tree right against the boundary fence by the Oriental garden. We have dropped several, so far unsuccessful, hints regarding keeping it pollarded to prevent it becoming to dominant. I decided to remove the worst offending boughs, the main branches will be placed, in a corner of the garden, to become a wildlife sanctuary, with the whips along with some Cornus trimmings, being woven into a small natural edge to the bed behind the banana bench. The remainder will be chipped for mulching around the shrubs in the Oriental garden. My compost bins are in a poor state of repair and need replacing. I have for two years, had one of the local authority garden waste recycling bins. This has reduced the need for so many bins here. I have replaced one with an extra leaf bin, this is such a useful garden by-product, either for mulching or adding to potting compost that I don’t send it away from the garden. We have been fortunate to have recently enjoyed some winter sun, thus enabling me to make some progress on the maintenance list, while enjoying the winter sunshine, entertained by bird song. What winter maintenance projects do you have for your garden?